Snapchat has been on a bit of a roll adding new features recently with no sign of stopping soon. The company is today launching two new features: Multi-Snap and Tint Brush. Mutli-Snap lets you record multiple video snaps in seamless succession. All you have to do is hold the record button beyond usual ten-second limit and Snapchat will automatically begin filming the next clip. You can have up to six clips in a row, and the videos play without a gap in between them. As usual, you can apply a variety of effects to your recording, and they’ll carry though to each Snap in your sequence. You can also delete any ten-second clip, but it doesn’t seem like you can re-arrange them. Your friends will receive the clips in chronological order, and they can tap to skip any individual clip as usual. 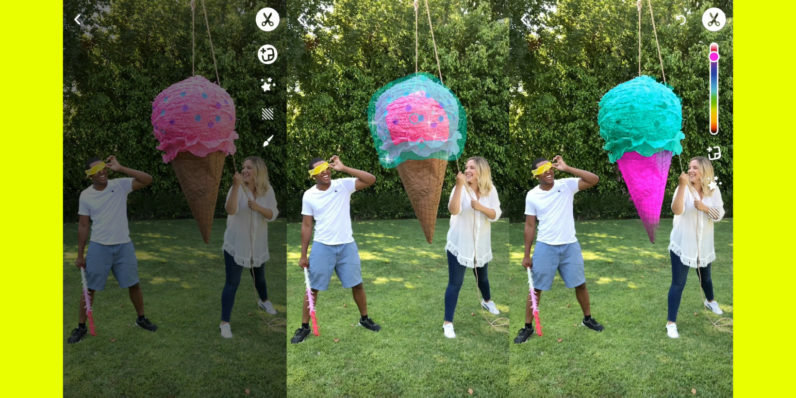 Snapchat videos have always been limited to ten seconds, so multi-snaps gives users a workaround if they need to capture anything longer. While part of me wonders why Snapchat didn’t just increase the limit to 60 seconds instead of stitching together six shorter ones, it makes it easy for impatient people to skip through the sequence if there isn’t much interesting. The other neat feature is Tint Brush, which basically lets you recolor pretty much anything in your snaps. Hair, shirts, giant ice cream cones, you name it. The feature is tucked away in the Vertical Toolkit on the right of your screen. Tap the new Tint Brush icon, pick a color, and trace the object you want to recolor. I imagine it will become pretty popular as people begin to give themselves new haircolors. Tint Brush is rolling out today to iOS and Android. Multi-Snap is also rolling out today on iOS, but Snapchat says Android users aren’t far off.